I’m getting into my Buddha Bowl these days. In fact, I’m on a health kit and have decided to have a Buddha Bowl at least 4 times a week. It think it will help me focus on clean eating and greater mindfulness toward my food and what I’m putting into my body. 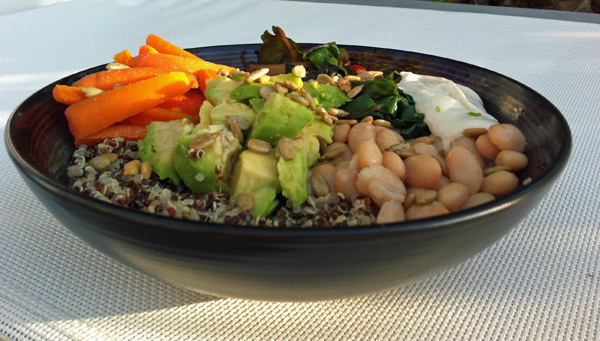 A Buddha Bowl is a meal of simple pure food and enjoyed with deep gratitude. Some think it comes from the tradition of Buddhist monks and their “begging” bowls or the alms bowl. In predominantly Buddhist countries like Laos, each morning Buddhist monks walk the streets in an alms ceremony accepting bits of food from lay believers, who place a small handful of food into the bowls they hold at their hips. The Bowl – The bowl is very important. You are supposed to choose one that is only used for this semi-sacred meal. I hunts for mine for several weeks. I preferred to buy one from a second-hand shop and I wanted it to have beautiful colors. While in Sonoma, I scoped out the shops and found two I liked. I wanted two so that I could share my Buddha bowls with another. (Hope springs eternal!) I have to say I don’t *love* my bowls, so I continue to search out shops hoping to find the perfect one(s). Chopsticks – I don’t actually use chopsticks, but I think I should. Using a pair would complete the aesthetic experience and most important for me – slow down my eating. Chopsticks would help me pick up one piece of food at a time and taste it more thoughtfully. The fun of creating your Buddha Bowl each night is to use different colors, textures, tastes of your food – salty, sweet, spicy. The variety is endless! I’ve also decided to make all of mine bowls vegan – no dairy or eggs – mainly in an effort to make the meal as “clean” (non-processed foods) as possible. 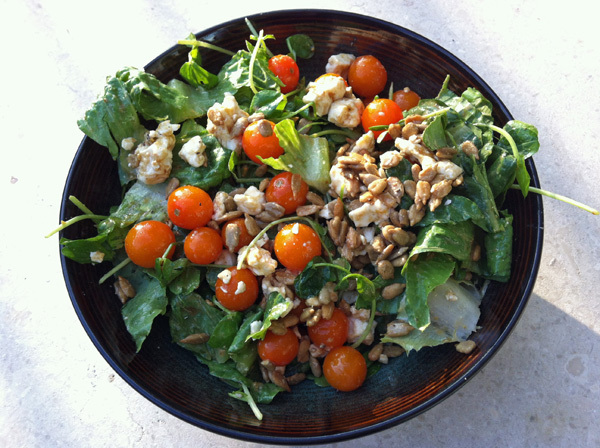 I have to admit, I could have more reverence toward my Buddha Bowl. I think this this is an ongoing process of slowing down during meal time and giving myself the space to think about all level of nourishment. It’s all about being grateful in our lives. All in one bowl! Check out these *beautiful* photos of all manner of Buddha Bowls on Pinterest. This entry was posted on Friday, August 15th, 2014 and is filed under Food & Drink.